You can use the BIME Scheduler to refresh your data in Déjà Vu, Managed Storage, or BigQuery. The BIME Scheduler is a cross-platform service that you can install on a server or terminal in-house to run separately from the BIME UI. Note: The computer or machine that the Scheduler is installed on must be running to manage refreshes. If the machine is turned off, the Scheduler will restart automatically when turned on. Before installing the Scheduler, you must have 2GB of RAM available. Each system requires a separate installation procedure. Download and unzip the file BIME Scheduler-Linux. The Scheduler will now load each time your machine starts up. Download and unzip the file BIME Scheduler-Macintosh. Double click the file 'click-me-to-install-scheduler'. The Scheduler is now running and can be accessed from BIME Desktop. Download and unzip either the BIME Scheduler for a 64 bits system or BIME Scheduler for 32 bits system. Navigate to your bin folder. Launch the install script by clicking Install.bat. Start the Scheduler by clicking Start.bat. You can check if the Scheduler is running in the Windows Services list. After you finish installing, you can connect the Scheduler to your BIME account. 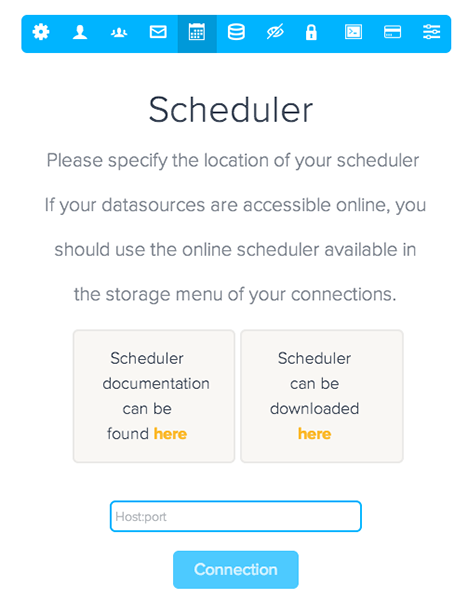 Only users with administrative rights can manage the Scheduler. Note: Some connections are not available for the Scheduler. For more information, see Connections not available for the Scheduler. Sign in to your BIME account from BIME Desktop, then open the Admin menu ( ) on the left panel of your screen. Click the Scheduler icon ( ). Provide the address of the machine running the Scheduler and the port used (9100 by default). All connections using a cloud storage solution are displayed, whether a schedule is already set or not. Click on your connection to open the Schedule details window. Select the refresh rate of your connection. Modifications will not be saved until you click Save. You can refresh any connect manually by clicking on the refresh button to the right of the connection. If you encounter a problem with the refresh, you will see details on the error. Otherwise your status should read Success. If your connection is not stored in the cloud (Déjà vu, Managed Storage, or BigQuery), you will not be able to schedule a refresh for it. If your connection is an Excel or CSV connection created on the BIME Web interface, you will not be able to schedule a refresh for it. Instead, your file is uploaded to BIME, and you will have to reimport the file each time you want to refresh. Add file connections in BIME Desktop instead of the BIME Web interface. Any data will then be directly fetched from your file system.